Certificates and documents | Swifter, s.r.o. To deserve your trust, we would like to share with you who we are and what we stand for. Therefore we present to you the documents that are the foundation of our everyday work. The trade licence is proof that we have fulfilled the statutory requirements to run the business we are in. You can verify the data registered on our company in the Trade Register of the SR at: www.zrsr.sk . The General Terms and Conditions of Freight Forwarding are rules we apply in our work and constitute an inseparable part of any freight forwarding contract you conclude with us. Take some time to go through the conditions that will be the basis of our cooperation. Since we are responsible in our business, we have taken out insurance coverage for potential risks related to the provision of transport services. Forwarder liability insurance covers the potential damage that may occur when we carry out our activities. Have a look at our forwarder liability insurance contract, together with the general insurance terms for the forwarder liability insurance. 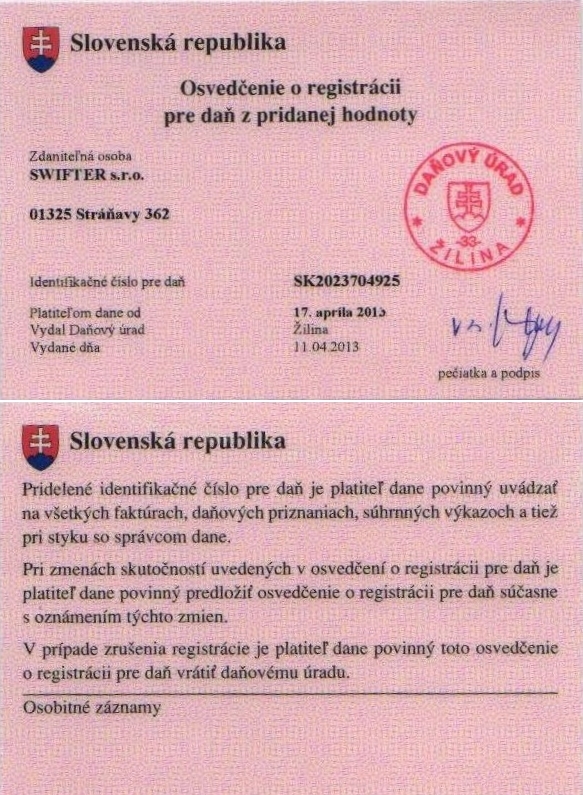 Our company is a legal entity registered in the Business Register of the Okresný súd Žilina, Insert no. 58473/L, Section: Sro. (District court in Žilina) The extract from the Business Register for our company is available at www.orsr.sk or simply download it here. We are a VAT taxable entity. Have a look at our certificate of registration for VAT, which proves that we have duly met VAT registration requirements and thus became a VAT taxable entity. The EORI number is a unique identifier serving to identify business entities when communicating with the customs authorities of EU member states. Businesses then do not have to register in each member state where they carry out their business activities. All business entities with a registered office in the EU or third country business entities communicating with customs authorities of EU member states need to have the EORI number. The expert knowledge of our employees matters to us. One member of our team holds a certificate proving that he has attended the Dangerous Goods Safety Advisor training. The certificate was issued by the Ministry of Transport, Construction works and Regional development of the SR.